The Lower Oder Valley National Park, which is characterized by the Oder floodplain, largely consists of open landscapes and provides a habitat for rare animals and plants. The Lower Oder Valley National Park is one of Germany’s National Natural Landscapes and the only River Floodplain National Park in the Federal Republic of Germany. It has a length of 50 kilometres, is a maximum of five kilometres wide and covers an area of over 10,000 hectares. On the west bank of the Oder it stretches from Hohenstaaten in the south to Staffelde in the north. West of it there is a buffer zone of more than 17,000 hectares, which has been designated as a landscape protection area of the “Lower Oder Valley National Park region”. The Lower Oder Valley National Park is the only National Park in the State of Brandenburg and is mostly located in the Uckermark district; only a small part in the south belongs to the district of Barnim. The largest municipality surrounded by the National Park is the national park town, Schwedt/Oder, which is also the largest city in the Uckermark with more than 30,000 inhabitants. The close juxtaposition of large industrial enterprises such as PCK Raffinerie GmbH or Leipa paper mill and the National Park is one of the special features of the protected area. The national park legislation, which was amended in 2006, found a comprehensive balance of interests between these highly diverse neighbours. The Potsdam state parliament established the National Park with the passing of the Brandenburg National Park Act in 1995. The amendment in 2006 aimed at noticeably improving the acceptance of the National Park in the region. After 10 years, it has become evident that the balancing act was successful. Without challenging the ambitious objectives of a National Park, the region and its inhabitants feel much more involved in the development and protection of the National Park. Among other things, this also enabled a better touristic use of the territory. Riding, cycling and hiking trails have been designated, and in summer guided canoeing tours are available in parts of the National Park. It is also allowed to swim in selected waters. In the interests of nature conservation, the law established, among other things, the future wilderness zones at 50.1 per cent of the National Park’s surface, from which humans will retreat in the medium to long term. The area is characterized by so-called polders, which were set up for flood protection at the beginning of the 20th century according to the Dutch model in order to provide the river with more space during high water levels. At its sometimes steeply ascending edges, remnants of pristine forests are found, such as the Gellmersdorf Forest in the south or Gartzer Schrey in the north of the Lower Oder Valley National Park, but also extensive areas of dry grassland with partially continental grassland steppes. 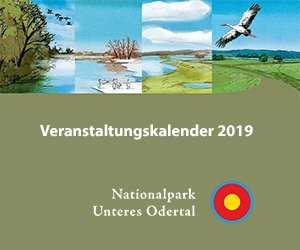 The Lower Oder Valley National Park provides habitats for many rare and protected plants and animals, including otters, black terns, great bitterns or corncrakes. With its flooded polders, it is an ideal resting place for numerous migratory birds in winter. Already in September, cranes rest for several weeks in the Oder Valley during their migration south. Among the birds that can be observed in winter are the whooper swans. When the flooding conditions are favourable, even Eastern bird species such as white-winged terns and whiskered terns or little gulls keep using the National Park as a breeding ground during the warm season. The National Park forms a unified natural environment with the Polish side of the Lower Oder Valley. It is bordered by the Landscape Conservation Park of the Lower Oder Valley (Park Krajobrazowy Dolina Dolnej Odry) as well as the Zehden Landscape Conservation Park (Cedynski Park Krajobrazowy). The Polish and German protected area administrations maintain a close cooperation, for example in matters regarding the cross-border tourist development of the Oder Valley. The protected area administrations west and east of the Oder are defined as parts of the cross-border Lower Oder Valley Nature Reserve.